About 700 students recently moved in to Baylor’s new East Village Residential Community, which features Hallie Earle Hall and Gordon Teal Residential College. These buildings honor two prominent Baylor alumni who you might have read about already, but did you know that The Texas Collection houses their papers? Read on to learn more about Earle and Teal, and discover how you can learn more about their contributions. Dr. Hallie Earle was the first female doctor in Waco, and the first female graduate of the Baylor College of Medicine. However, many do not know the fascinating history of her entire family. The Graves-Earle family papers in The Texas Collection chronicle the history of this influential McLennan County family, including the life and work of Major Isham Harrison Earle and his daughter, Dr. Hallie Earle. Isham Harrison Earle became a major in the Tenth Texas Infantry during the Civil War. His experiences and those of his extended family are intimately documented in a large collection of correspondence. This correspondence, ranging in date from 1848-1960, tells the history of the Graves-Earle family before the Civil War and for many years afterwards. Major Earle was also Central Texas’s first official weather observer, creating a National Weather Station in Hewitt in 1880. Included in the collection are his detailed and comprehensive weather observation journals began in 1870. These journals were continued on by his daughter Hallie, who was appointed as Cooperative Weather Observer by the U.S. government in 1916. 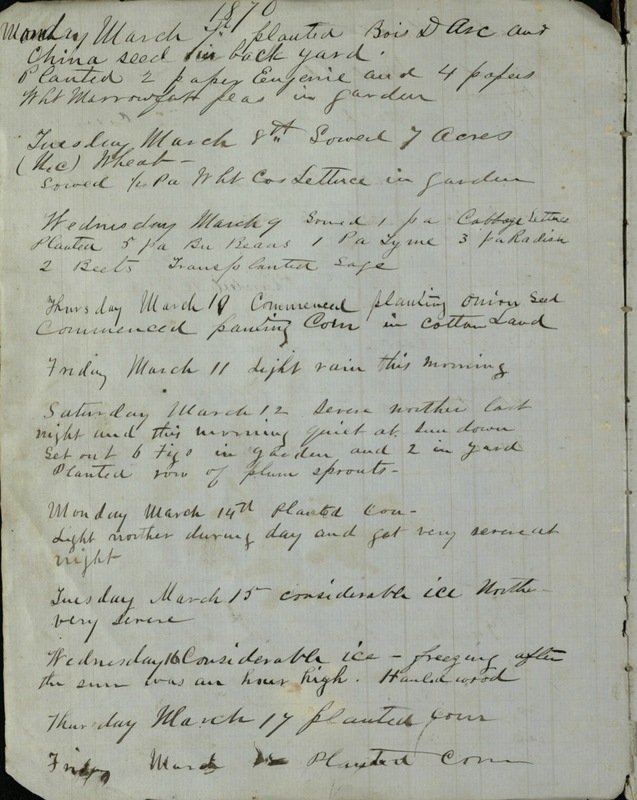 Major Isham Harrison Earle’s weather observation journal for Central Texas, March 1870. His daughter, Hallie, continued weather observation work, in addition to her medical practice. In addition to her contributions to weather observation, Dr. Hallie Earle kept a daily diary from 1895-1963, and all of these are preserved in the collection. Dr. Earle’s medical career is documented by a large series of medical documents, various diplomas, and correspondence. Finally, the papers contain a large, unique collection of photographs. These include 19th century daguerreotypes, ambrotypes, and tintypes, and a scrapbook made up of candid photographs of the family in the early 20th century. The Graves-Earle family’s world comes to life in these images. The influence of this family continues today with the opening of Hallie Earle Hall at Baylor, and continued preservation of the historic Earle-Harrison House in Waco. These papers will provide an excellent research opportunity for anyone interested in studying Victorian and Edwardian Waco, medical history, agricultural history, meteorological history, or cultural history. This image illustrated a “The Baylor Line” article about Teal, “Baylor’s Gift to Twentieth Century Scientific Technology,” September-October 1964. “We can envisage clearly the contributions of electronics to the lives of our children living in 2012 A.D. They will be highly educated by electronic teaching machines…communicate by means of satellites instantaneously to any part of the solar system… voice opinions on national and local government policies by voting electronically from their homes…” Fifty years ago, Baylor alumnus Gordon Teal made these predictions. While some are more accurate than others, technology definitely has enjoyed immense progress thanks in large part to Teal. Gordon Kidd Teal was a product of Texas and of Baylor. Born in Dallas in 1907, he graduated from Baylor with honors in 1927 with a bachelor of arts in mathematics and chemistry. While at Baylor, he served as president of the Scholarship Society and Latin Club, vice president of the senior class, member of the Baylor Chamber of Commerce, and ran with the track team. For those interested in what chemistry classes were like during the 1920s, some of Teal’s lab notebooks can be found in his papers. On May 5, 1962, the 50th anniversary of the Institute of Radio Engineers’ (IRE) publication, Dr. Gordon Teal composed a prophetic article in which he predicted what life would be like 50 years later in 2012. See how close his predictions were! After earning a master’s degree and a PhD from Brown University, Teal worked at Bell Telephone Laboratories in New Jersey. 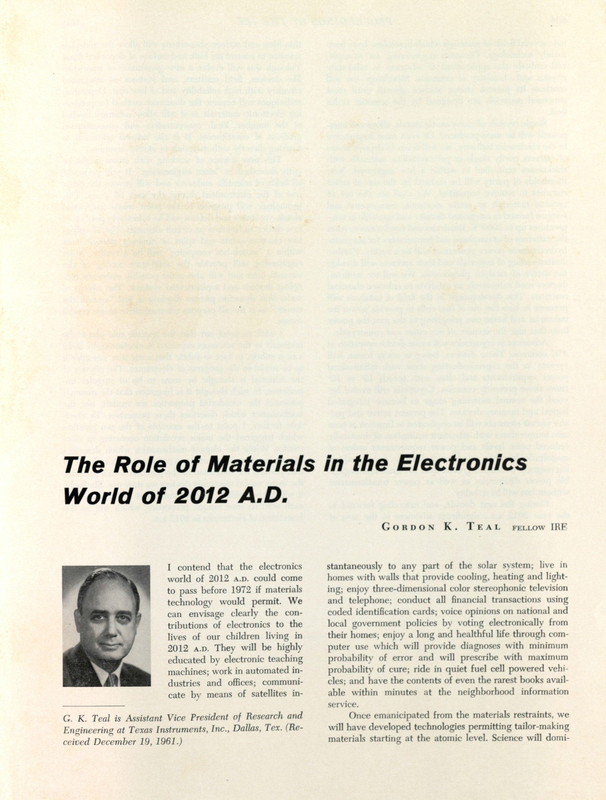 For nearly 22 years, Teal accumulated patent after patent with his ground-breaking research in germanium and silicon. These crystals, which had once been deemed useless by the greater part of the scientific community, proved to be anything but. Teal, as evidenced by the extensive research he accumulated in his papers, was determined to use these elements to perfect the transistor. In the early 1950s, Teal returned to his home state with a position at Texas Instruments (TI). In 1954, Teal and his team revealed the first commercial silicon transistor, which revolutionized electronics in the military, industry, and space exploration. The excitement that this invention created among the public can be witnessed in the news releases and clippings found in the Teal papers. 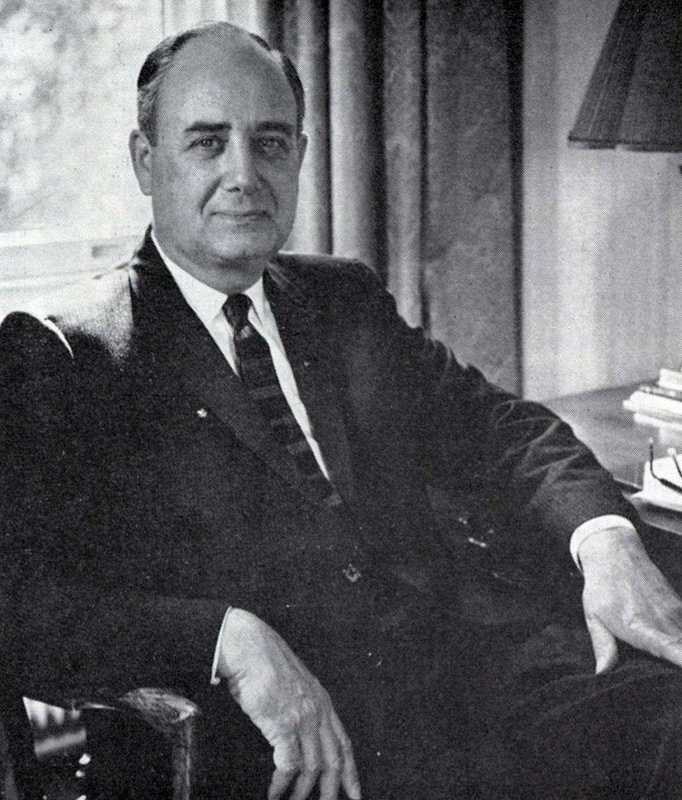 Teal worked at TI until 1965 when he was appointed the first Director of the Institute for Materials Research at the National Bureau of Standards. He served a two-year term and then returned to TI, where he remained until retirement in 1972. Teal gave back to the Baylor community by serving on the Board of Trustees from 1970-1979. Today, Teal’s love of science lives on through the Gordon K. Teal Scholarship in the physics department, and now with the Teal Residential College for Engineering and Computer Science. His papers are a helpful resource to those interested in Teal, the development of the silicon transistor, uses of germanium and silicon, science and engineering history, and the history of science education. Interested in learning more? Check our our Flickr sets below showcasing a few items from the Graves-Earle family papers and the Gordon Kidd Teal papers, and of course, come see us at The Texas Collection! Sadie C. Cannon papers, undated: An unpublished manuscript, Sing Hallelujah, describing the author’s life in the American South during the 1880s. Chapman-McCutchan papers, 1845-1903: Financial documents, legal documents, and literary materials relating to early Texans William S. Chapman and William H. McCutchan. Georgia Infantry during the American Civil War. Elsie and Tilson F. Maynard papers, 1942-1983: Primarily letters from former members of the Emmanuel Baptist Church of Waco who were serving in the armed forces during World War II. Addressed to Reverend and Mrs. Maynard and other church members, many of the letters express their writers’ gratitude for the church’s concerns and prayers. 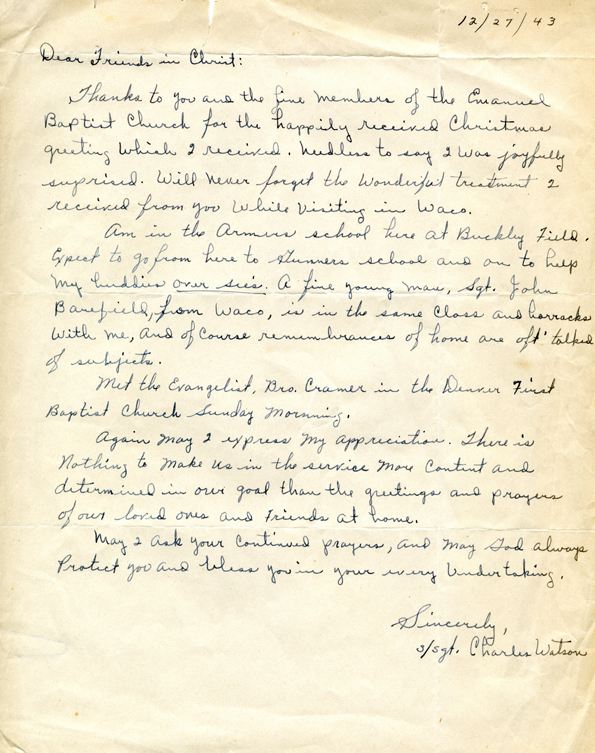 Staff Sergeant Charles Watson thanks Emmanuel Baptist Church for their Christmas greetings, noting that “There is nothing to make us in the service more content and determined in our goal than the greetings and prayers of our loved ones and friends at home.” Many more letters like this one can be found in the Maynard papers. [Waco] Memorial Baptist Church collection, 1943-2003: Materials compiled by Waco’s Memorial Baptist church concerning the church’s financial, legal and historical records, from the inception of the church to its closing. 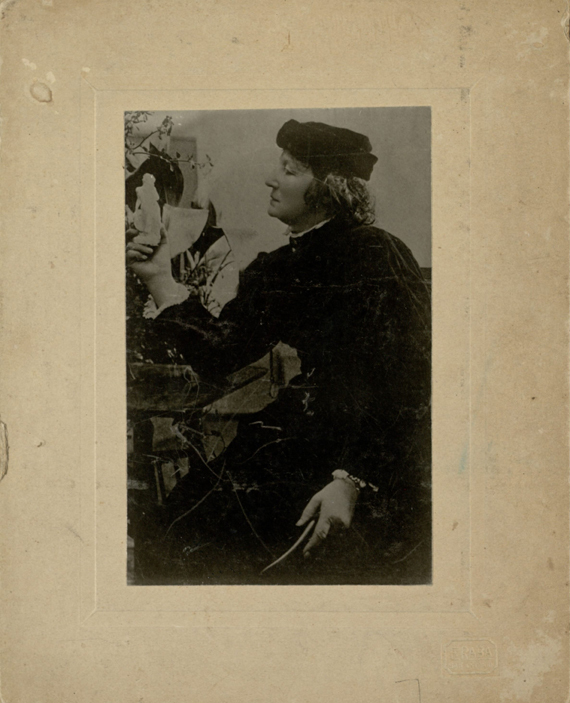 Ney-Montgomery papers, 1836-1913: The Ney-Montgomery materials consist of literary materials, manuscripts, correspondence, legal documents, and photographic materials relating to artist Elisabet Ney and her husband, Edmund Montgomery. Gordon Kidd Teal papers, 1919-1990: School materials, personal materials, professional materials, and awards accumulated by Dr. Gordon Kidd Teal, a famous twentieth century scientist who graduated from Baylor University in 1927. Teal invented the first commercial silicon transistor for Texas Instruments, among other achievements.